Pull together side-by-side servings of easy weeknight mac and cheese or double up on make ahead breakfast casseroles with the Ayesha Curry home collection stoneware set of two 12-ounce baking au gratins. A stylish profile gives these au gratins just the right accent of table-ready chic design, while 12 ounces of cooking space offers plenty of room for individual signature recipes or a side dish of potatoes gratin. The durable stoneware is long-lasting, heats foods evenly and features an easy cleaning, stain-resistant glazed finish that stylistically incorporates Ayesha Curry signature heart logo, making this versatile cookware perfect for an oven-to-table dinner party with friends or a holiday meal with the entire family. Plus, this Ayesha Curry kitchenware helps support no kid hungry to provide up to 500, 000 meals to children in need. Learn more at nokidhungry.Org/onedollar. Whether finishing off his and her portions of eggplant Parmesan or baking up a batch of ayesha's smoky cheddar mashed potatoes, cleanup is easy with these dishwasher safe au gratins. Ayesha Curry stoneware is also freezer and microwave safe, so make plenty of leftovers for a quick lunch on the go or for when weekend stomachs start Growling. 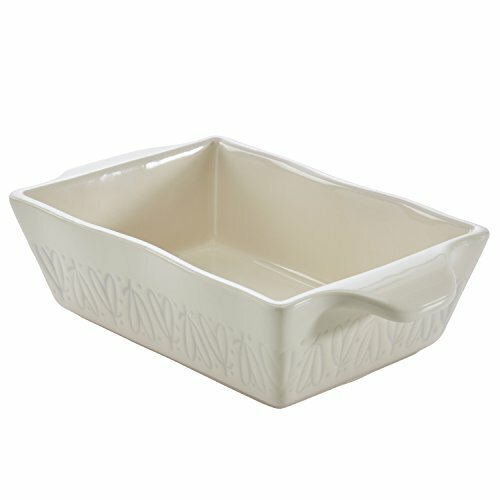 WELL designed, eye-catching and easy to use, the Ayesha Curry home collection stoneware 12-ounce au gratin set is a natural complement to the entire Ayesha Curry line and the perfect cookware to discover your kitchen cool without the fuss.